Dana Katz (second from left) accepted the award at the Pentagon from (far left) U.S. Army Gen. Martin E. Dempsey, chairman of the Joint Chiefs of Staff; Jeffrey Smith of Newman’s Own; Kenneth Fisher of Fisher House Foundation; and Alex Neill, executive editor of Military Times. 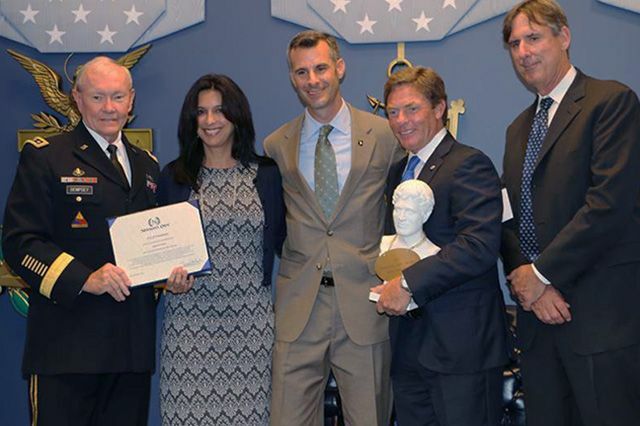 UCLA Operation Mend was honored with a 2015 Newman's Own Award and $50,000 grant during a ceremony at the Pentagon on Sept. 2. The annual awards recognize ingenuity in programs that benefit service men and women and their families. Operation Mend connects the military’s resources with the skills of surgical and medical specialists at UCLA, providing complex surgeries and mental health care — all free of charge — to service members in a family-centered environment. Taking care of service members and their families is "such an incredibly large task that it really does take an extraordinary public-private partnership," said U.S. Army Gen. Martin E. Dempsey, chairman of the Joint Chiefs of Staff of the U.S. Department of Defense, who spoke at the ceremony. He added that commitments of the military are going up, while budgets are shrinking. “We're just going to have to help each other as Americans,” he added. Operation Mend was founded at UCLA in 2007 by Ronald and Maddie Katz following a visit to Brooke Army Medical Center in Texas, where they met service men and women who had been wounded in Iraq and Afghanistan. The annual awards are sponsored by Newman's Own, Fisher House Foundation and Military Times. In addition to Operation Mend, which received the highest honor, five other organizations each received a grant of $30,000. Selected from more than 300 entries for this year’s awards, the recipients led the field in terms of impact in their respective communities, creativity and innovation.